The mystical marvels of tobacco. One of the marvels of tobacco, and that which brings most admiration, is the manner how the priests of the Indies did use of it, which was in this manner: when there was among the Indians any manner of business of great importance in which the chief gentlemen, called casiques, or any of the principal people of the country, have necessity to consult with their priests in any business of importance, then they went and propounded their matter to their chief priest. Forthwith in their presence, he took certain leaves of the tobacco and cast them into the fire and did receive the smoke of them at his mouth and at his nose with a cane, and in taking of it, he fell down on the ground, as a dead man, and remaining so, according to the quantity of the smoke that he had taken, and when the herb had done his work, he did revive and awake and gave them their answers according to the visions and illusions that he saw while he was rapt of the same manner, and he did interpret to them as to him seemed best, or as the devil had counseled him, giving them continually doubtful answers, in such sort that howsoever it fell out, they might say that it was the same, which was declared and the answer that they made. The Indians of our Occidental Indies use the tobacco to take away the weariness, and for to make lightness of their labor, for in their dances they be so much wearied, they remain so weary that they can scarcely stir; and because that they may labor the next day and return to do that foolish exercise, they do receive at the mouth and nose the smoke of the tobacco and remain as dead people, and being so, they be eased in such sort that when they be awakened of their sleep, they remain without weariness and may return to their labor as much as before, and so they do always when they have need of it; for with that sleep they do receive their strength and be much the lustier. 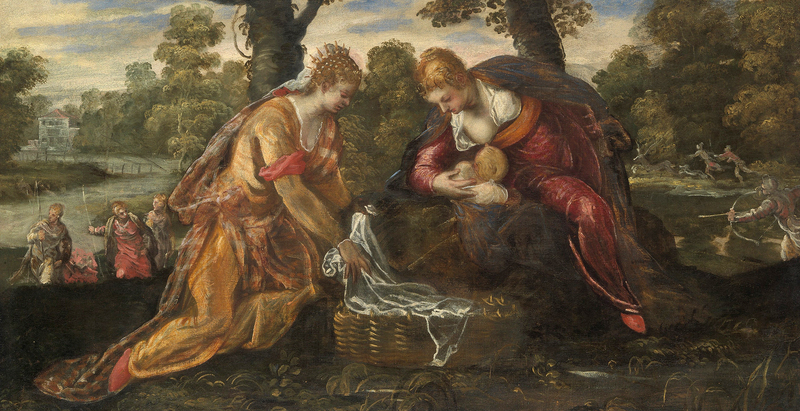 The Finding of Moses, by Tintoretto, sixteenth century. The Metropolitan Museum of Art, Gwynne Andrews Fund, 1939. The Indians do use the tobacco for to suffer dryness and also for to suffer hunger and to pass days without having need to eat or drink, when they shall travel by any desert or dispeopled country, where they shall find neither water nor meat. They receive there of little balls, which they make of the tobacco. For they take the leaves of it and do chew it, and as they go chewing of them, they go mingling with them certain powder made of the shells of cockles burned, and they mingle it in the mouth altogether until they make it like dough, of the which they make certain little balls, little greater than peas, and they put them to dry in the shadow, and after they keep them and use them in this form following. When they are to travel by the ways where they find no water nor meat, they take a little ball of these, and they put it between the lower lip and the teeth and go chewing it all the time, and in this sort they journey three or four days without having need of meat or drink, for they feel no hunger, dryness, nor weakness, nor their travel troubles them. I do think that to journey after this sort is the cause they go chewing continually the little balls; they bring phlegm into the mouth and swallow it into the stomach, and so they maintain themselves thereby, the like whereof we see to happen in many beasts, for that a great part of the winter, they be shut up in their caves and hollow places of the earth, and pass their time there without any meat, for that they have to consume the natural heat of the fatness, which they had gotten in the summer. The bear being a great and fierce beast, much time of the winter remains in his cave and lives without meat or drink, with only chewing his paws, which perhaps he does for the said cause. This is the substance that I have gathered of this herb, so celebrated and called tobacco. From Medicinal History of Things Brought from Our West Indies. Not long after receiving a medical degree in his native Seville in 1547, Monardes began this treatise—containing the first published illustrations of tobacco—on the curative powers of plants found in the Americas. Besides advocating for the benefits of tobacco, he popularized sassafras tea as a potent elixir. The book was translated into English (and given the enticing title Joyful News Out of the New Found World) by John Frampton in 1577. It was widely read by Elizabethans.